The life-size wooden cross in the middle of the sanctuary at Broadway United Methodist Church in Indianapolis is draped in purple and beneath it sits a bucket of nails. For the 40 days of Lent the cross represents both a reminder of God’s activity in the world and an invitation to realign our lives if we have gone astray. In the week leading to Easter, a time where the life, death on a cross (a tool of state execution), and resurrection of Jesus will be remembered, millions of Christians will gather together to celebrate that nothing can separate us from the love of God, not even death. Mary provides us some answers. 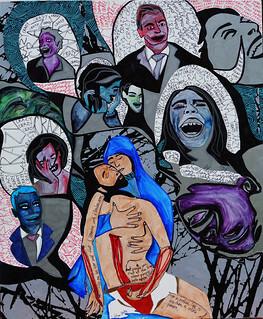 In her 2015 installation of the Stations of the Cross, http://www.stations2015.com her theme is mental illness. The Stations can be used to enhance the observance of Holy Week because the raw and provocative images draw us into deeper reflection on the mystery of the Christian faith. I met Mary this spring at the Mental Health Symposium hosted by St. Paul’s Lutheran Church in Baton Rouge, where Mary’s father, the Rev. Mike Button, is the pastor. Mary presented her Stations of the Cross during this Symposium at both St. Paul’s and at Our Lady of Lakes, the largest Catholic Hospital in Louisiana. I learned afterwards at dinner that Mary was the first woman in remembered history allowed to give a homily from the pulpit in the Catholic hospital’s chapel. She just took breaking the silence to a whole new level. I asked Mary to share with us about what inspired her to create the Stations of the Cross Mental Illness and explain some of the images she uses in her work. Sarah: Mary, your art is a visual testimony and tells stories about mental illness. What inspires your work? Mary: Station 11 “Jesus is nailed to the cross” is a super personal one. It addresses the epidemic of suicides at New York University when seven students in the course of one academic year committed suicide. This was in the wake of my own hospitalization for depression. Sarah: Your art weaves together your personal experiences of living with bipolar disorder and the tragic history of the shame and stigma surrounding mental illness. This particular Station reminds us that suicide is one of the leading causes of death for young people. Your art also is another way to help break the silence about mental illness and opens up conversations that otherwise would be avoided. 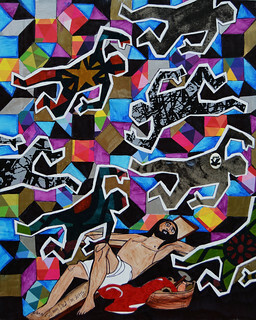 Mary: In Station 12 “Jesus dies on the cross,” I do realize that, on the face of it, the piece could be read as being opposed to psychiatric medications which I most definitely am not. What I’m trying to get at with that piece is to ask folks to consider some of the questions raised by issues of self-determination and civil liberties when dealing with the care and treatment of people with mental illness. It’s important to be open about developing treatment plans and medical directives in advance of the medical crises that happen even when folk are doing the very best they can. I’ve benefited, along with many others, from mutual support networks like Depression Bipolar Support Alliance and NAMI’s peer-to-peer programming. Sarah: Everyone could benefit from having a mental health directive so that we are prepared and informed about all of our rights and treatment options. According to research by the National Alliance on Mental Illness (NAMI) one out of four Americans will experience a mental illness, so why not prepare ourselves and family members. Wellness Recovery Action Plan is also another resource to help us in our mental health prevention and recovery. The silence about mental illness, the shame and stigma, prevents us from making these positive and proactive steps. 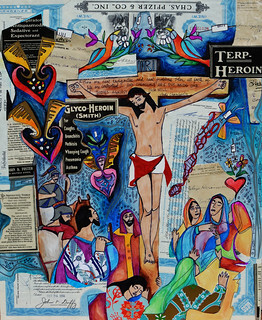 Mary: Station 13 “Jesus is taken down from the cross” addresses the stigma of mental illness. In our conversations about mental illness we can find grace. No one is untouched by this issue. People with mental illness have a lot of gifts to bring to faith communities. During Holy Week, take a few minutes to look at Mary’s Stations of the Cross Mental Illness. How can we see mental illness differently through the lens of faith? What does a crazy cross look like to you?